Starfish, more commonly referred to by scientists as sea stars, are covered with a hard, bony outer skeleton. Their ability to cling to rocks with suction-cup-like feet and their hard exoskeletons make them difficult to find and eat for most other creatures, but starfish do have several predators. Sharks, manta rays, Alaskan king crabs and even other starfish prey upon them. Only sharks that swim near the bottom of the sea eat starfish. Nurse sharks, horn sharks and Port Jackson sharks are all known to eat them. All of these sharks have strong enough jaws to crush the hard bony outer skeleton of the starfish and eat the flesh underneath. There's not much meat there, however, and most sharks prefer squid and other soft-bodied animals that are easier prey. Manta rays are large dark-brown or black sea creatures closely related to the shark. They don't have teeth, and must eat by sieving their food through their mouths. Manta rays primarily consume plankton but will eat whatever they encounter, including starfish. 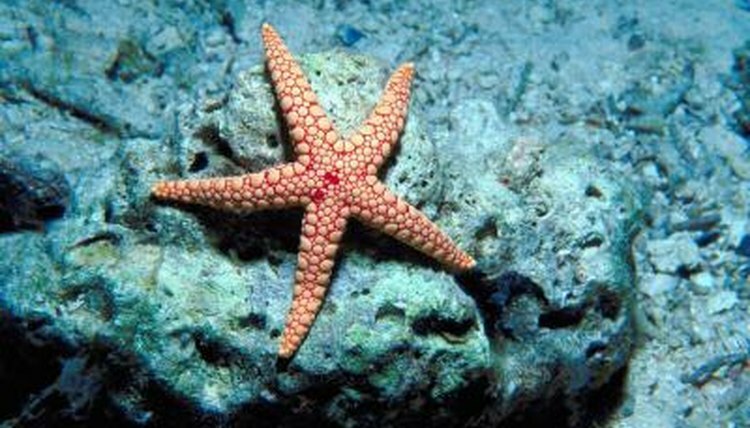 They frequently feed near coral reefs where starfish are found, since coral reefs provide them with abundant food. Alaskan king crabs live in the cold ocean waters near Alaska. They eat many sea creatures, including starfish. They will also eat worms and even other crabs. The Alaskan king crab prefers to tear apart the starfish before consuming it. It will rip the starfish into manageable chunks to make it easier to eat. If the starfish can get away from the crab with its main body intact, it can regenerate its lost arms. Perhaps most surprising is that starfish will indeed eat other starfish. Larger ones may prey upon immature or smaller ones if no other food sources are available. Starfish follow their prey by using scent trails. They use their multiple arms to hold the prey against their underside, where the stomach emerges to engulf the prey. It then returns to the starfish's body cavity, clutching the engulfed prey to digest it. What Eats: What Eats a Starfish?